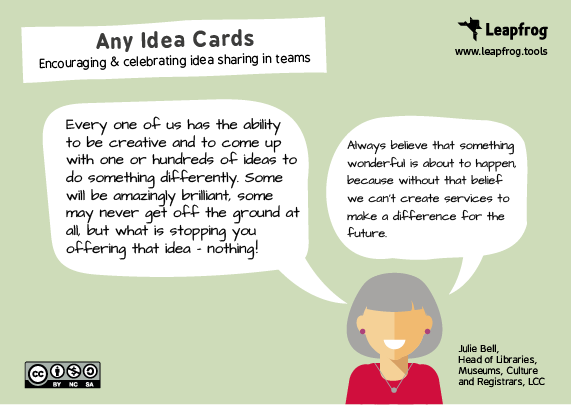 Any Idea cards are a pack of cards to motivate library staff to think of and share their creative ideas with the rest of the team, their managers and Julie Bell, Head of Libraries at Lancashire County Council. Each prompt card has the address of Julie Bell on the back in the style of a postcard to encourage staff to send their ideas to Julie. There is also introduction card at the top of the pack which includes a message from Julie and instructions for how to use the cards on the back. The packs of cards have been distributed to library managers throughout Lancashire.